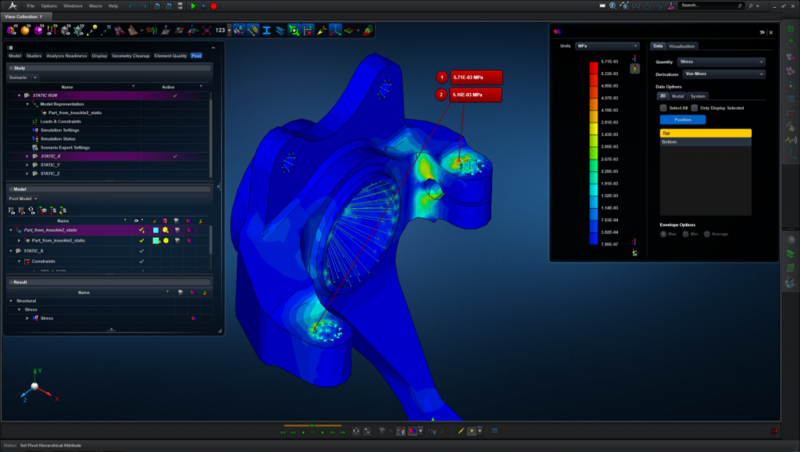 The latest release of MSC Apex allows you to post process results from MSC Nastran. In this blog post, we discuss some brief examples and towards the end we cover the steps necessary to view MSC Nastran results in MSC Apex. 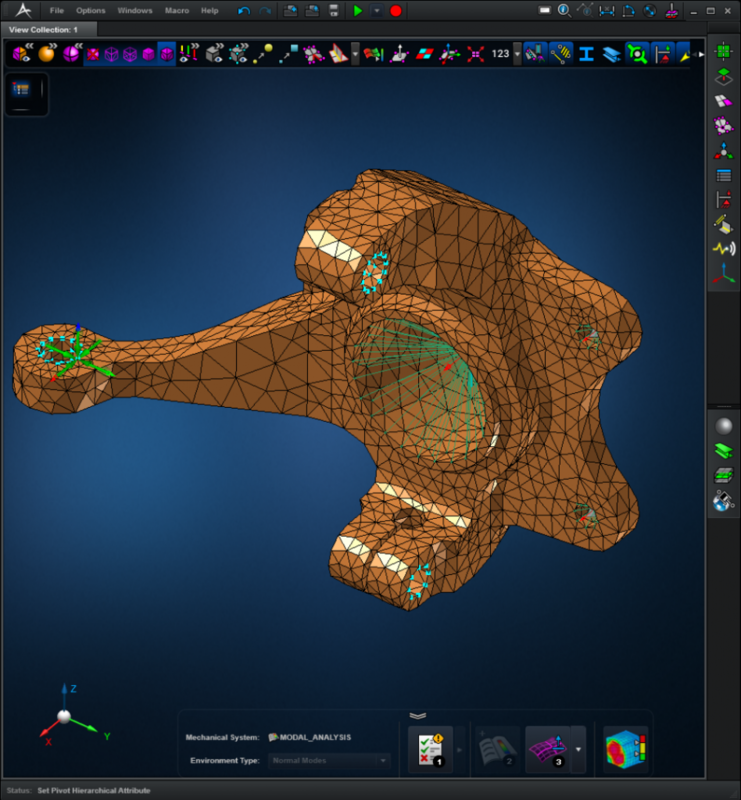 Note that MSC Apex supports import of the HDF5 file (.h5) that is generated by MSC Nastran. 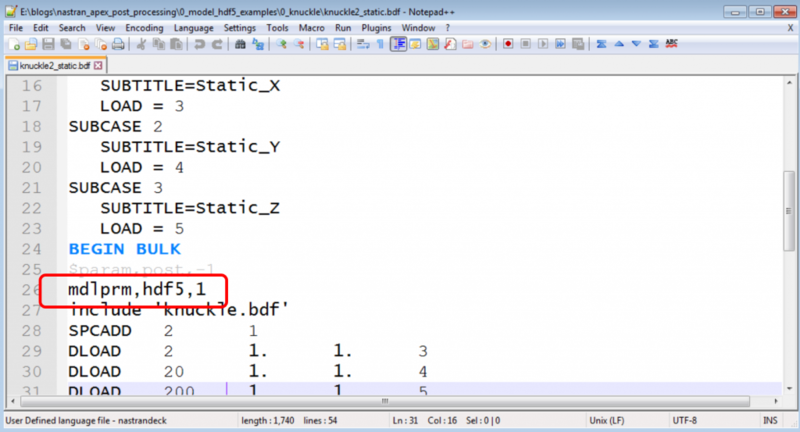 The first example we will discuss is an example found in the MSC Nastran Test Problem Library and is named knuckle2_static.bdf. This BDF file was created by a separate pre-processor, but the MSC Nastran results contained in the HDF5 (.h5) file can be opened and viewed in MSC Apex. As shown in the image below, the von Mises stresses are reviewed. Carrying on with the same example from before, a normal modes analysis is performed by MSC Nastran. Like before, the results are contained in the .h5 file are imported to MSC Apex and reviewed. As shown in the image below, the first 6 normal modes are displayed. 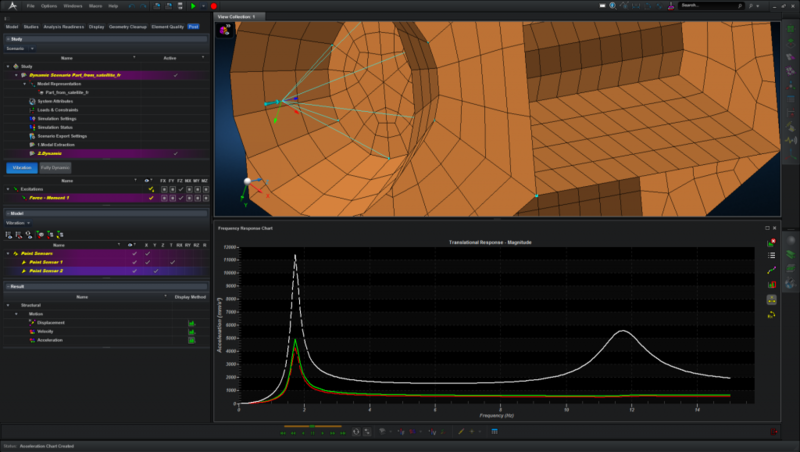 This next example was originally created by MSC Apex, then a BDF file was exported and analyzed by MSC Nastran. The .h5 result file was then imported to MSC Apex and a plot of the frequency response, in this example acceleration vs. frequency, was created. 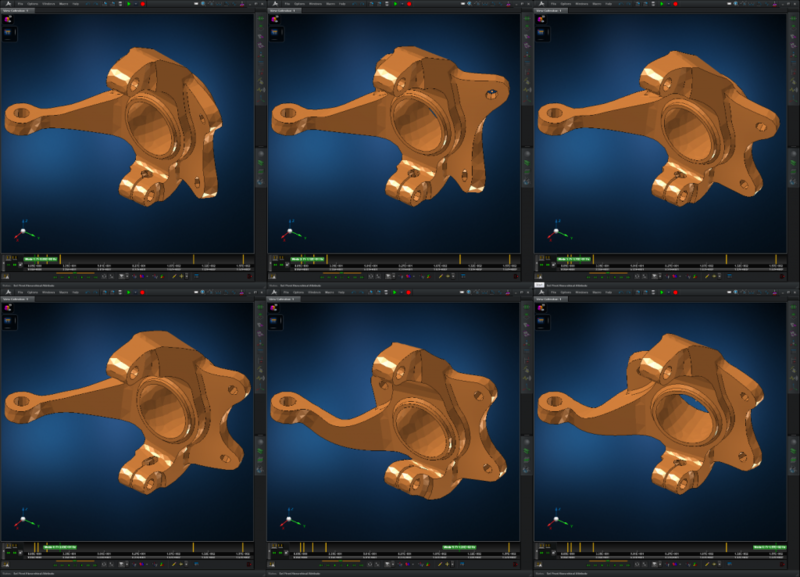 Importing MSC Nastran results to MSC Apex is a straightforward process. There are a few settings that can be easily overlooked and are discussed here. Before starting, be mindful of the units. Throughout the import process, you will be asked to specify the units system utilized by the Bulk Data File (.bdf) or HDF5 file (.h5). 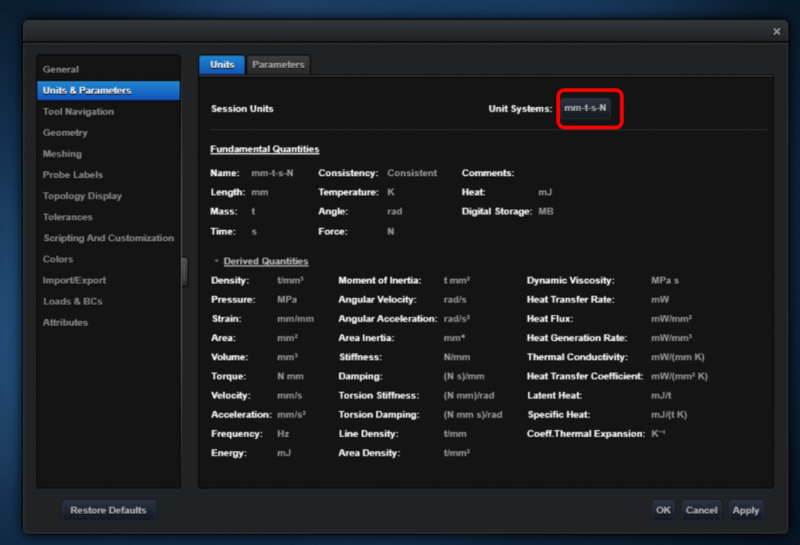 If the units as configured in the Application Settings are different, it can cause confusion when viewing model data. For example, the imported BDF file is using units of: in-slinch-s-lbf, but the MSC Apex session is configured to display units in mm-t-s-N. One can quickly become confused when a force in the .bdf file is 22.48 lbf, but in MSC Apex, the displayed force is 100 Newtons. It is suggested that the application’s units be updated to match that of the imported .bdf or .h5 file by going to Options > Application Settings. A BDF file can be imported by going to File > Import FEM. 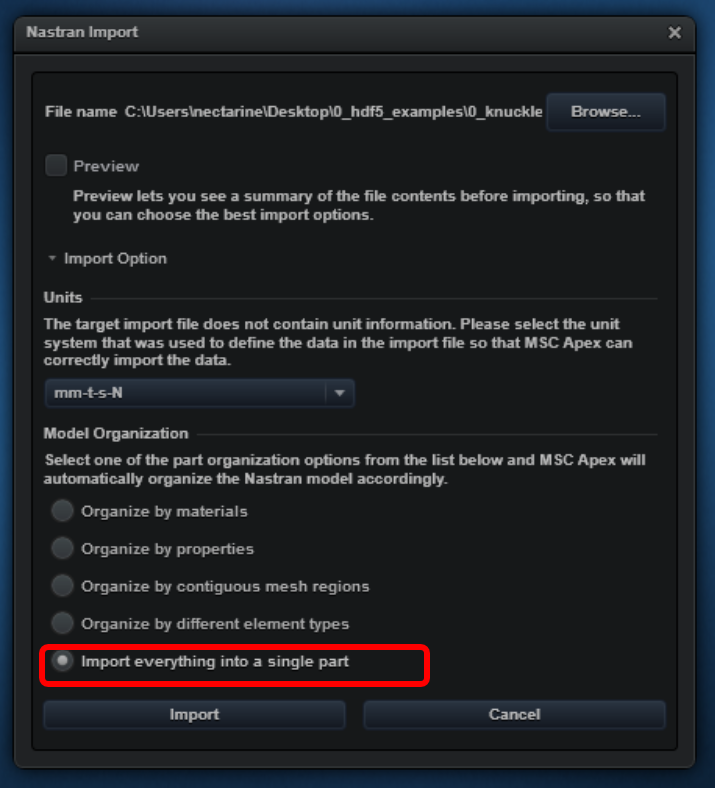 For new users, start with this setting: Model Organization: Import everything into a single part. MSC Apex has requirements that must be met by the HDF5 file. As a start, ensure that the ‘1’ option is used by the MDLPRM, HDF5 entry. Please refer to the MSC Apex documentation for more information. 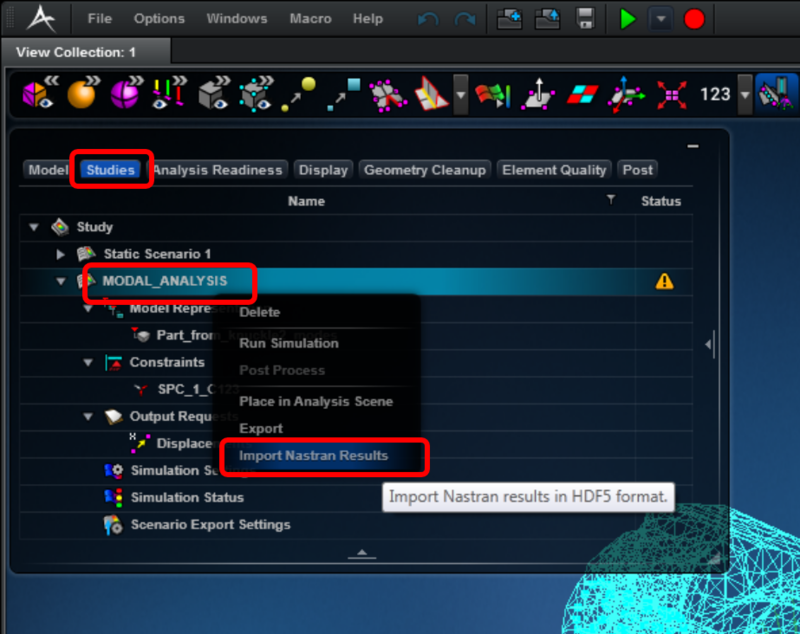 To import the MSC Nastran result file (.h5), go to the Study tab in the Model Tree. Right click on the imported Study, in this example MODAL_ANALYSIS, and click on Import MSC Nastran Results. 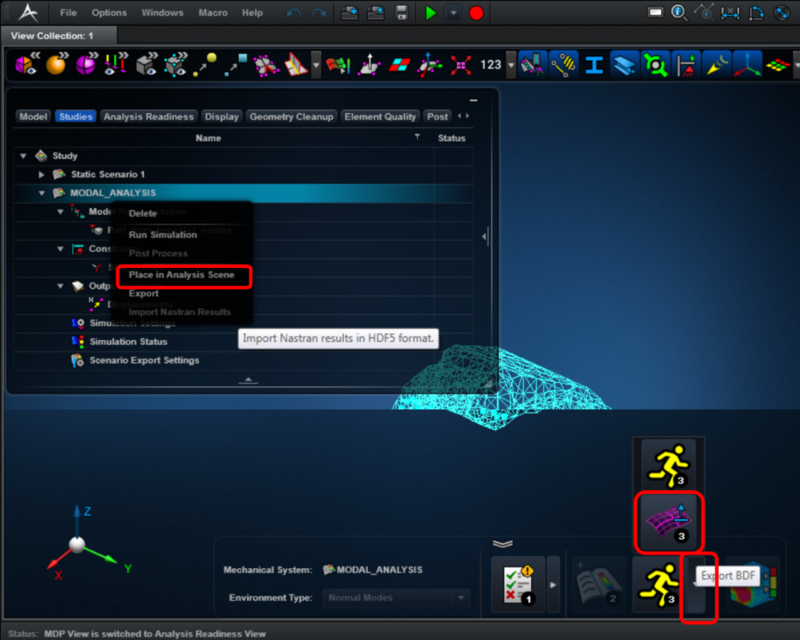 If the Import MSC Nastran Results option is disabled, you will first have to click Place in Analysis Scene, followed by clicking on the Export BDF icon (Purple Mesh Icon with the number 3). After the MSC Nastran .h5 file is imported, the results may be post processed as usual.